Gridlock returns to Capitol Hill. If you're searching for a sign that the financial crisis is no longer a national emergency, then look no further than Congress—which appears to have returned to business-as-usual mode. As little as a couple of weeks ago, a second fiscal stimulus package seemed a likely product of a lame-duck session of Congress. Now, second thoughts about the use of $700 billion Wall Street bailout fund, the impending change in government and partisan politics, are derailing that effort, say observers. "The unity seems to be gone, the emergency looks to be a little less pressing," says former ten-term Republican congressman Bill Frenzel, now with the Brookings Institution. "Some members in Congress believe that when they voted on the rescue package, they were sort of pressed into that without knowing enough about it. Now, they're less anxious to go ahead." That assessment is shared by economists, lobbyists, business groups and Congress watchers. A $25 billion emergency loan to the auto industry is now on life support, though lawmakers are trying to fashion some sort of alternative before the lame-duck session ends this week. The only major fiscal stimulus measure likely to be approved now is another extension in unemployment benefits, which given the deteriorating labor market, seems politically acceptableto both parties. "Everything else is off the table," says Scott Talbot, chief lobbyist for the Financial Services Roundtable, which represents the financial services sector. The fiscal stimulus equation changed dramatically recently because of two key developments, one of them foreseen, the other largely an surprise. In the national election two weeks ago, the Democratic party recorded sizable additions to existing majorities in the House and Senate and regained the White House. Given solid Republican opposition, including the possibility of a filibuster in the Senate and a veto from the White House, Democrats can wait until next year, at which time they can pass a bigger, more ambitious stimulus package, with President Barack Obama's input and blessing, which could total $300 billion.
" The real need here is massive fiscal stimulus in the form of a big middle class tax cut," says Greg Valierre, chief strategist at the Stanford Washington Research Group. "This lame duck session isn't going to sink its teeth into anything that big." 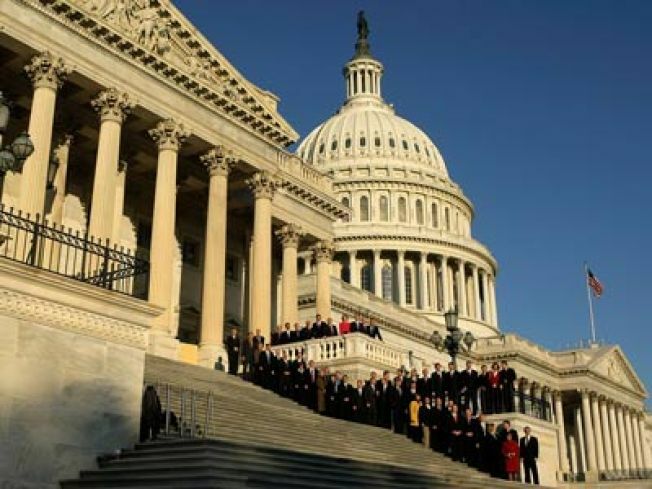 Valierre says the stimulus package could wind costing between $500 and $700 million, and work on it might begin as early as Jan. 6 when the new Congress is sworn in, two weeks before the inauguration of the president. "I think it is possible to wait awhile to get a better idea of what is needed and what we can do," says Frenzel. Prudence, if not a luxury of time, which seemed out of the question just two months, may exist now, given the government's massive capital infusion into financial firms, part of the $700 billion TARP program. "There's a sense, the program seems to have stopped the bleeding, provided some additional liquidity," says John Irons, research director at Economic Policy Institute. Optimists point to Treasury Secretary Henry Paulson's announcement this week that he would not seek access to an additional $350 billion, leaving its use to the incoming administration. "The effects of that have not really been felt yet," says Talbot, who adds Paulson's decision may give the government a "better idea of where money is most needed." In that context, there's been growing speculation that Democrats might have other designs on the remaining funding, such that the law could be rewritten or the money essentially reallocated to cover other sectors hurt in the crisis, such as housing. Mortgage modification and foreclosure prevention are high on the list. House Financial Services Chairman Barney Frank (D.-Mass.) has already proposed using some of the remaining money from the first TARP tranche to pay for the automaker bailout. All of that points to a modest effort in the lame-duck session and expanded unemployment benefits appear to be something that can't wait. "That’s one piece that makes a big difference now than doing it in late January," says Irons.. Since the original 13-week extension was signed into law in late July, the jobless rate has jumped from 5.7 percent to 6.5 percent. "The original extension is not commensurate with the challenges of finding work given the real crash in hiring," says Andrew Stettner, deputy director of National Employment Law Project. According to Stettner's analysis, by the end of the year some 1.2 million people will have exhausted state and local jobless benefits even with the extension. Continuing jobless claims recently topped 4 million, the most in 25 years. Current proposals would add another seven weeks of benefits for recipients in all states and 13 for those in the most hard-hit ones. Aid to cities and states, as well as funding for infrastructure projects can be delayed until next year, if the recipients know they can count on it, say observers. Not everyone is prepared to wait, however. The National Association of Manufacturers, which supports the auto bailout package, will ask Congress for $20 billion in "ready to go" infrastructure projects, corporate pension plan aid, a tax holiday on repatriated profits for multinationals and a "couple other things", according to the trade group's vice president Hank Cox. Some analysts say whether it is sooner or later, a stimulus package won't make much of a difference and like other forms of government intervention will only delay the time it takes for balance sheets to adjust. "The fundamental issue for the economy is wealth losses, households hit on the housing and front and stock markets," says Combinatorics Capital managing director and economist Ram Bhagavatula, which has caused a retrenchment in borrowing and spending. "That structural adjustment account will be for us for awhile. A stimulus package won't offset that."